"I'm the Archmage [sic] of the College of Winterhold." "I have a house, but not room for you." The following children will become available for adoption if their parents are killed. 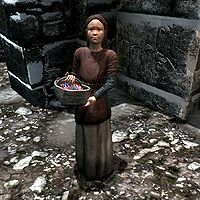 They will be moved to Honorhall Orphanage in Riften and can be adopted from there provided you haven't already adopted two children. Grelod the Kind must also be dead, and the courier needs to have delivered the letter from Constance Michel about adopting in Riften. Note that some parents may be essential and unkillable until certain related quests have been completed. These people are dead already. All three player-built homes have the same options for a child's room. After building the Main Hall, you must add the two single beds and a dresser for their clothing and toys. It is not necessary to build the Bedrooms addition on the west wing of your home; however, if you do build it, you must build both the child's beds and child's chests in order to adopt even one child; your children will then move into the bedroom. Boy: "You need something, ma/pa?" Girl: "Did you need something, mama/papa?" You can give your children gifts and an allowance, and your children will occasionally also offer you a gift. You can give your children sweets, apples, clothing, dolls, wooden swords, certain books, and daggers (stolen items cannot be used). They will thank you and reward you with the blessing The Gift of Charity. Their older weapons, clothes, dolls, etc. will be kept in the child's chest, if they get a new one. Children will always prefer to play with their newest weapon regardless of its quality. "It's time for us to move." — You can decide which house your family will live in if you have more than one house available. You may move them to a new house with this option. Their pets will move with them; however, they will leave the contents in their chest behind. At any time you can ask your spouse how the children are getting on, and depending on your spouse's voice type you will receive one of four types of response, arrogant, neutral, Nord or Orc. Each location has a unique response too. Breezehome Arrogant "As well as can be expected. Dear, this house would work for the two of us, but with children? We need to find a bigger place." Neutral "Just fine. 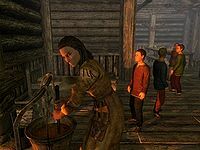 Whiterun is a lovely city, and there are so many other children here- they all love playing together." Nord "Couldn't be better. Whiterun is perfect for a child- great weather, plenty of space, friends to play with. What more could you want?" Orc "Fine, fine. Plenty of kids here to play and spar with. Plenty of trades to learn. It's a good place to raise a child." Hjerim Arrogant "Hmph. This city's crawling with filth. It's everything I can do keep the children safe." Neutral "Well, love, very well. There's so much history in this city, so many things we can do here." Nord "Great. 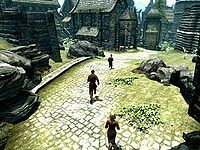 There's so much history here in Windhelm, so much to learn about our ancestors and our land." Orc "Good. This is a city that respects strength. Honors it. A good lesson for children to learn." Honeyside Arrogant "Oh, fine, if you want to bring up little pickpockets. This place is a terrible influence on a child." Neutral "Just fine, love. The weather here is wonderful, perfect for playing outdoors." Nord "Well enough. Riften's a tough city, but... it's a tough world. Kid has to learn to stand up for themselves sometime." Orc "Hmph. This city's crawling with thieves. Cowards. Kid could learn some bad habits here." Proudspire Manor Arrogant "Oh, fine. So many guards on the street here I hardly have to worry." Neutral "Very well, love. This is a beautiful house, and Solitude is so safe, so diverse. It's a wonderful place to raise a child." Nord "Fine, just fine. This house is perfect for a growing family." Orc "Meh. Children get soft when they're coddled in a place like this." Vlindrel Hall Arrogant "You tell me. Between the Forsworn and the mines, Markarth is no place to raise a child." Neutral "All right. 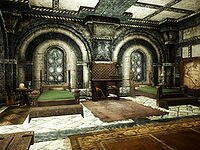 I do worry, though, no matter how many times the guards say Markarth is safe." Nord "Honestly, I'm a little worried. Markarth is nice enough, but... I wonder if it's really safe for children." Orc "Fine, fine. This city's not safe, but... that's good. Keeps a kid on edge, alert. Could keep 'em alive when they grow up." 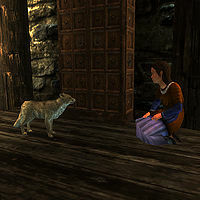 Player-built houses Arrogant "Fine, when we're not fending off attacks by wolves. Or bears. Or giant spiders. Honestly, what were you thinking, sending us out here?" Neutral "Fine, love. I think the fresh air does wonders for all of us, and this house... it's just perfect." Nord "Fine, fine. Living out here on our own will take some getting used to, but I think it'll be good for us." Orc "Better than ever. Nothing like living off the land to teach you how to fight, how to survive. We'll have a little warrior on our hands in no time." When initiating dialogue with any girls after they have been adopted, they may say "I like it here. The tree in the park is so pretty!" even if they aren't living with you in Whiterun. This page was last modified on 23 March 2019, at 17:31.